Museo mundial – Resources and Recycling - How many mobiles do I need? How many mobiles do we need? The installation "How many mobiles do we need?" focuses on the extraction and waste of resources connected to mobile phones. About 1.8 billion of these devices were sold worldwide in 2013. 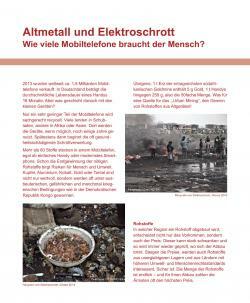 The average lifespan of a mobile phone in Germany is only 18 months The old models end up in drawers, in rubbish bins or are exported either as second hand articles or (illegally) as scrap to Africa, India or China to be resold and eventually recycled after a couple of years, often in unprofessional, unecological and very unhealthy ways. You can find over 60 different substances in a mobile phone. Some of the raw materials, such as gold, tantal, copper or silicon, are extracted or produced under unbearable, hazardous and sometimes warlike circumstances in the southern hemisphere. So, it is very important to repair and recycle, and about 80% of the materials used in mobile phones are recyclable. The installation is displayed in the Bronze Age section of the Nuremberg Natural History Museum. The installation refers directly to a showcase right next to it that displays an ancient hoard: a vessel filled with remains of pieces of metal that were used in the Bronze Age to make different kinds of products. However, what will archaeologists find while excavating in the year 3015? Mobile phones, bits of plastic and metal from our era? The new showcase holds a vessel filled with old mobiles and their component parts. Moreover, it displays some of the important resources needed for electronic commodities accompanied by information on their most important places of origin. 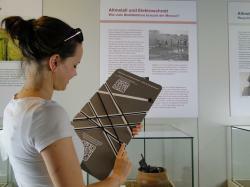 An exhibition board provides an introduction to the topic. It displays information on global sales and the average lifespan of mobile phones. And, above all, it discusses the raw materials used in mobile phones, their extraction and possible ways of recycling them. An interactive puzzle shaped like a popular child's game completes the installation. This game is a “bandolo”. The aim of this game is to connect point a (a question) to point b (the right answer) through the use of a cord. The "bandolo" asks questions related to the topic, for example on the estimated amount of electronic rubbish that will be produced in 2017 or on the “ecological rucksack" of a single mobile phone. In this way, the puzzle strongly connects the topic to the everyday life of visitors. 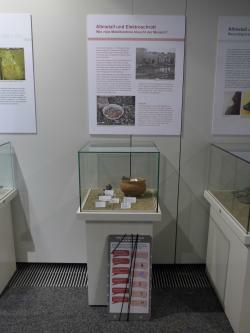 The installation is complemented by educational programmes offered to visitor groups. These educational programmes include examining important minerals and investigating to what extent mobile phones can be mended. For example, is it possible to repair or replace parts of the phone or are the parts firmly glued in place? This installation sheds light on Millennium Development Goal 7 (7.A: "Integrate the principles of sustainable development into country policies and programs and reverse the loss of environmental resources") and MDG 8 ("Develop a global partnership for development"). It also touches on health issues. A museum visitor playing with the "bandolo"
Visit the museum that you will be working with and get an overview of the exhibition. Conjointly choose the object and topic you want to work with. The topic of valuables, resources, and recycling has a natural connection to something comparable in the past: a hoard from the Bronze Age. Other types of objects that might be connected to this development topic are objects demonstrating historical working conditions, trade objects or objects from geological formations, such as different stone materials. Try to create a comprehensible and easy connection to the existing objects. → Make connections to the region, the actors involved and the style of storytelling used in the object. In our case, we built these connections by using the hoard theme, enabling the visitor to compare an ancient and a modern hoard. Choose an aspect of the topic that is both complex enough and well-defined enough. Do you want to provide an overview of the value chain of electronic devices? Would you like to concentrate on a certain part of the story? If so, which one? Develop interesting methods that can be used to implement your idea. For our installation, we added the bandolo as an interactive tool to complement the showcase. You should also check how much space will be available at the museum, which technical facilities the museum can offer, which target group you want to address and how much money you can invest. → Think small, start small. In the implementation process, additional ideas will arise, so be prepared to save some money to invest later on in the process! For example, we decided to buy a second case of minerals that may be handled by visitor groups participating in the museum’s educational programmes. Produce a first draft of your idea, combining your ideas with those of your partners. Include a budget plan so that you can assess the practicability of your idea. It should include a schedule for the implementation process. Produce a draft that everyone agrees with and send it to all partners. Ask for quotes for every stage of production. Try to get recommendations on subcontractors that have already worked in museums. Add up the quotes and compare the total with your budget plan and adjust it, if necessary. Designing and printing were the main costs involved in this installation. We decided to get the printing done by a well-known subcontractor. The design was done by a graphic designer who was chosen in conjunction with the Department of Prehistory in order to get as close as possible to the design of the permanent exhibition – which was one of the department's requirements. Reading and researching takes place in parallel to designing the installation. Content inspires the form to be taken by the installation. Compose and write down the content for the exhibition board, the labels for the minerals and the questions for the puzzle. Ask your partners to proofread this first version so that you can clarify any misunderstandings at an early stage. Choose pictures, graphics and objects that underline the content of mineral value chains. Ask the copyright owners if you can use their material for educational purposes. We found a lot of interesting photographs on Flickr and uploaded some suitable photographs from Fairphone in particular. This company was very helpful and generous in regard to copyrights and allowed us to use their pictures. In other cases you might have to pay to use this material. For our installation, it was necessary to collect old mobile phones and examples of minerals like coltan, bauxite, copper ore, gold, among others. The Potsdam Institute of Advanced Sustainability Studies put together a small collection of minerals, which you can order via the internet. If you have a geology department in one of the museums in your area, you might as well ask there. Allow weeks or even months for collecting old mobile phones. Smartphones, in particular, are not easy to obtain. They are either collected by retailers or telecommunication companies or – if still in private hands – the owners are often reluctant to give them away because of the personal data that might still be "somewhere inside". Make sure that the new showcase has enough room and fits nicely with the permanent exhibit. The contents of the showcase can always be adjusted, so you do not need a dummy in this case. Do not put too many items in the showcase. The game “bandalo” is a kind of a quiz conntecting the right answers through a cord. Mostly it is made out of cardboard. Construct a model of the "bandolo" to get the lines right, because the right answers are visualized on the back of the board. (Try to get an example from your or your friends' kids.) Choose the colours of your main board and have a test print. Colours might appear different from what you intended. Finalizing the bandolo is a bit tricky and needs close contact to the designing person. Have a copy of the bandolo in original size to check whether all notches for the cord are in the right place. Test how long the cord will have to be. Is it still handy to use? If it is too long you will have to shorten the bandolo and discard questions (as we had to do). Ask your partners to do the final proofreading. Pay a professional proofreader if you included this in your budget plan. Send this concept to the designer. Correction loops: Several correction cycles will professionalize the final product. Ask the designer for two or three checks. → Identify the representatives from the museum that need to give their blessing to the final product. Try to keep this circle small to save time. Ensure the correction process is transparent to all those involved. Think of how to fix the main exhibition board to the wall. The curators will help. We used a very lightweight "forex" board that could be fixed to the wall with strong double-faced adhesive tape that can easily be removed. This installation method is very useful when you want to add an installation temporarily to a particular point in an exhibition and you want to be flexible. The bandolo was also printed on two-sided "forex" board. The material is much easier to handle than wood. It is lightweight and you do not need the help of a carpenter. However, it is not as durable. Since they are not very expensive to produce, we decided to have two boards printed so that one can be kept in stock to replace the other when it wears out. Take care when working with the cord. We decided on a strong cotton cord that, unfortunately, did not match the board’s colour scheme. The dyeing process shortened the cord considerably. Think about educational programmes while planning the installation. Is there any additional information you want to give? Do you have objects to go with the installation that are informative and engage the senses? We decided to hand out minerals. Can you tell the difference between bauxite and copper ore? Have you felt the weight of iron ore? Or tested it with a magnet? Have you seen and touched the notorious "conflict mineral" coltan? We disassembled smartphones to show the difference between those that are easy to mend and those that can only be discarded. The bandolo puzzle invites visitors to play with it, making it attractive to adults and students/schoolchildren alike. The installation fits in very nicely with the exhibition. The installation is so well-integrated with the surrounding exhibition that it is easy to miss it – according to some visitors' comments. 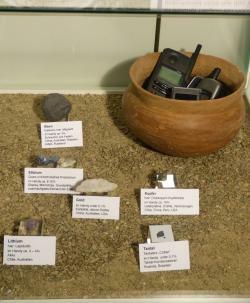 It would have been great to have more objects to handle in the installation – like minerals and mobile phone components. However, we decided against it because components like printed circuit boards are sharp-edged and likely to hurt visitors, whilst minerals run the risk of being taken away. So, both elements are part of the accompanying educational program. The bandolo was an experiment designed to keep the texts as short as possible. People with kids like the bandolo and know how to handle it. However, others might not be familiar with it and, therefore, they are likely not to touch or try it, even though brief instructions are printed on it. The bandolo is very popular with visitors. Several visitors emphasized that they are now motivated to recycle their old mobile phones and to consider what they have learned when buying a new mobile phone.